I was working in Shanghai on ‘Urban Fictions’, a photo & video project looking at the emergence of European-style theme towns in Eastern China. These are massive scale developments for China’s ever-expanding business elite. One day I came across a welder on-site and was dumbfounded that he’d be doing this highly-skilled and dangerous job wearing a cardboard mask. 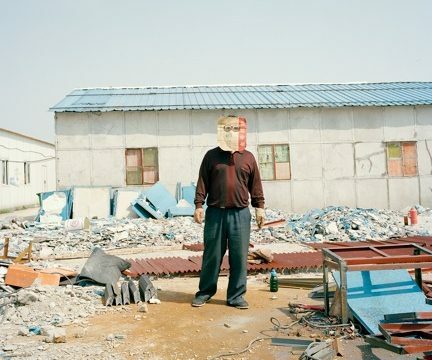 There was something preposterous about these enormous developments, essentially designed to showcase China as the powerhouse of the 21st century, built on the backs of migrant workers with such makeshift protective gear. Sad, slightly amusing, but true.